KARAWANG, Indonesia — A Lion Air plane carrying 189 people crashed into the sea just minutes after taking off from Indonesia's capital Monday. Officials said they weren't expecting to find survivors. So far, they said 24 body bags have been received by the forensics unit at a hospital in Jakarta. A technical log also sheds lights on the doomed plane's previous flight a day before. Indonesia's official search and rescue agency said it was unlikely that anyone had survived when the plane plunged into the Java Sea off Jakarta just 13 minutes after takeoff. Lion Air said the brand-new aircraft, on a 1-hour-and-10-minute flight to Pangkal Pinang on an island chain off Sumatra, was carrying 181 passengers, including one child and two babies, and eight crew members. The crash is a significant blow to the country's aviation safety record after the lifting of bans on its airlines by the European Union and U.S. The National Search and Rescue Agency's deputy chief, Nugroho Budi Wiryanto, said divers had not been able to access the main body of the aircraft underwater, despite fair conditions. He said search crews had been able to locate the plane's "black box" data recorder, however, using the pings emitted by the device, and they were were trying to retrieve it. The National Search and Rescue Agency's deputy chief, Nugroho Budi Wiryanto, said some 300 people including soldiers, police and local fishermen were involved in the search and that so far it had recovered no bodies — only ID cards, personal belongings and aircraft debris. "We are waiting for the miracle from God," said Wiryanto, when asked if there's any hope of survivors. Shortly after, however, search and rescue officials confirmed that some human remains had been recovered from the water. Identifying bodies will take about four to five days. A tweet from the national search and rescue agency showed six body bags containing the remains, which had been brought back to the airport. A couple hours later Wiryanto's agency said it did not expect to find any survivors from the crash. Indonesia's disaster agency earlier posted photos online of a crushed smartphone, books, bags and parts of the aircraft fuselage that had been collected by search and rescue vessels. With the sun about to set, strong currents and limited visibility were already starting to hamper the search and rescue efforts in the Java Sea. In spite of the danger of having divers in the debris-filled water as visibility decreased, search officials said the work would continue until instructions came to halt operations for the day. At the national search and rescue agency's headquarters in Jakarta, family members turned up, hoping desperately for news. "We still hope there will be survivors in this plane crash,” says Indonesian #RedCross spokesperson Aulia Arriani. @palangmerah sent 54 volunteers & 13 ambulances to help after the #LionAir crash of flight #JT610 to treat survivors, search & rescue teams, & passengers' families. The search and rescue agency said the flight went down in waters off West Java that are 98 to 115 feet deep. The crew had attempted to return two minutes after takeoff. Indonesia's National Transport Safety Board said the plane was traveling at 340 knots, which is considered to be fast. However, it's not clear why it was moving at that speed at the time of the crash. BBC News has obtained what it calls a "technical log" for Flight JT-610 a day before its fatal accident. It suggests that during that flight, the airspeed reading on the captain's instrument was unreliable. The altitude readings also differed between the captain's and first officer's instruments, BBC reported. "Identified that CAPT [captain's] instrument was unreliable and handover control to FO [first officer]," the log reads, according to BBC News. "Continue NNC of Airspeed Unreliable and ALT disagree." BBC reports that the crew on that flight decided to continue its journey and landed safely in Jakarta. It's not yet clear whether issues with the aircraft instruments played a role in Monday's crash. Lion Air's president-director Edward Sirait said the plane had a "technical problem" on its previous flight from Bali to Jakarta but it had been fully remedied. He didn't know specifics of the problem when asked in a TV interview. The Boeing 737 Max 8 was delivered to Lion Air in mid-August and put in use within days, according to aviation website Flightradar24. Malindo Air, a Malaysian subsidiary of Jakarta-based Lion Air, was the first airline to begin using the 737 Max 8 last year. The Max 8 replaced the similar 800 in the Chicago-based planemaker's product line. The pilot of Flight 610 had more than 6,000 flying hours while the co-pilot had more than 5,000 hours, according to the airline. 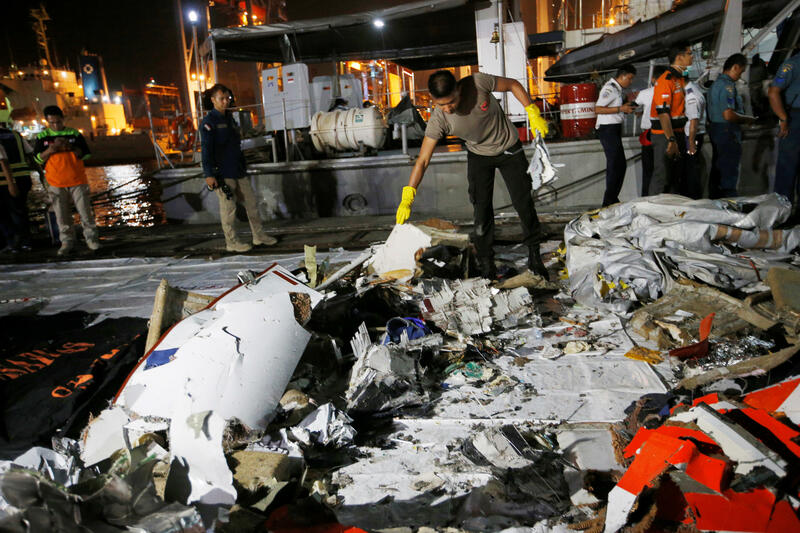 Boeing Co. said it was "deeply saddened" by the crash and was prepared to provide technical assistance into the crash probe, which will be carried out by Indonesian investigators. In its statement, the Chicago-based manufacturer expressed its concern for the 189 people on board, and offered "heartfelt sympathies to their families and loved ones." Selvanaban Mariappen contributed to this report.